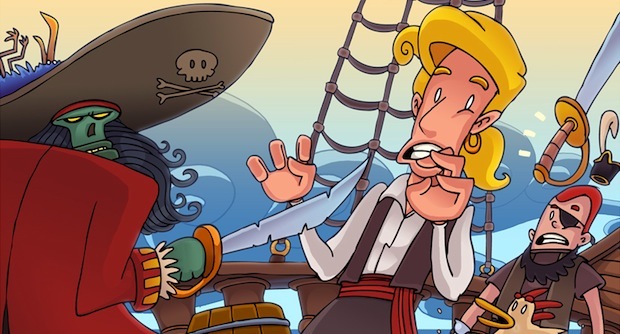 For this week only, developer Telltale Games is offering the full season of its Tales of Monkey Island series and Secret of Monkey Island: Special Edition for 20 bucks. Why both games -- the latter developed internally by LucasArts courtesy of CEO Darell Rodriguez's embracing of older IPs -- are being bundled is anyone's guess. We're willing to assume that it's to give newer folks to the near two-decade old series a glimpse of the new beginning and hook them into Telltale's five-part episodic series -- and then perhaps make them interested in the upcoming release of Monkey Island Special Edition 2: LeChuck's Revenge. The deal can be obtained through the developer's store until this Friday, May 7th.